What types of spiders live in Minnesota? That’s a good question. Until recently the types of spiders found in Minnesota, or any other state for that matter, was almost unknown. Spider identification never really caught on with wildlife enthusiasts like bird identification and butterfly identification. When it comes to spider identification, most people only wanted to know what types of spiders in their area are poisonous and how they ought to deal with them. A recent survey of Minnesota spiders done at Bethany Lutheran College fills in some of the state’s unanswered spider questions. Currently almost six hundred and fifty species are on the list, divided into approximatley three dozen spider families. With close to one hundred and forty species, Minnesota’s most diverse group of spiders are Sheetweb and Dwarf Spiders (Family Linyphiidae). They are basically the Mnnesota spiders most people has never heard about. The common name says it all. They are a large family (species wise) of small spiders that build messy looking webs in forests and fields. In some instances, the webs of dome spiders look like a dome at a distance. 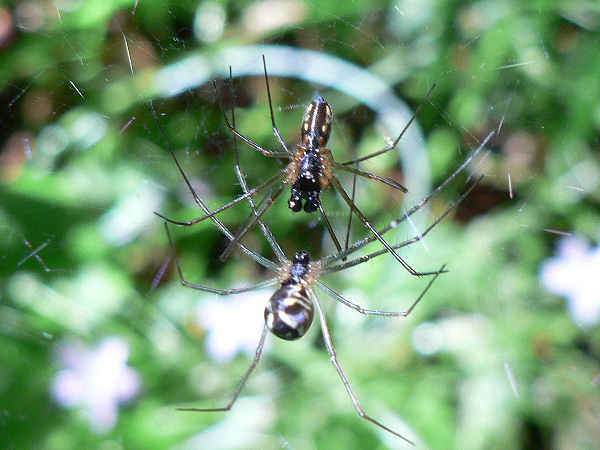 Sheetweb spiders have oval and elongated bodies. The picture at the top of the page provides one example of a species in the family. The cobweb spiders include the state’s primary spider of medical concern, the black widow. Sometimes a story comes out about the possibility of the Brown Recluse spider reaching the territory. A recent study, for example noted that a changing climate might make migration of the brown widow north possible. 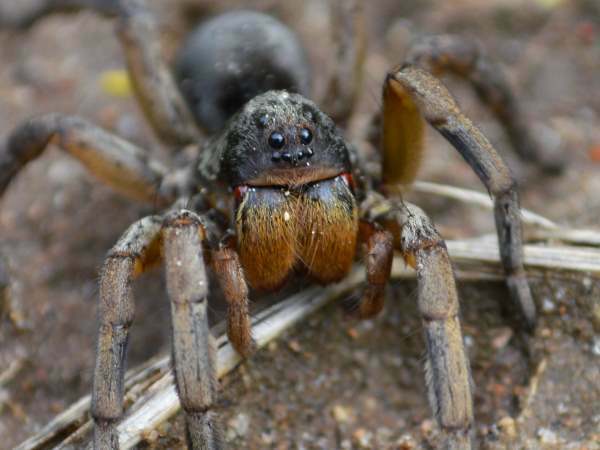 The remainder of the article provides an outline of the other more common Minnesota spiders. Please press the green spiders button for additional spider pictures and information. Orb Weaving spiders, the spiders that build round webs, are common accross the state. Two genera, the Araneus and Argiope are probably the most common in residential areas. 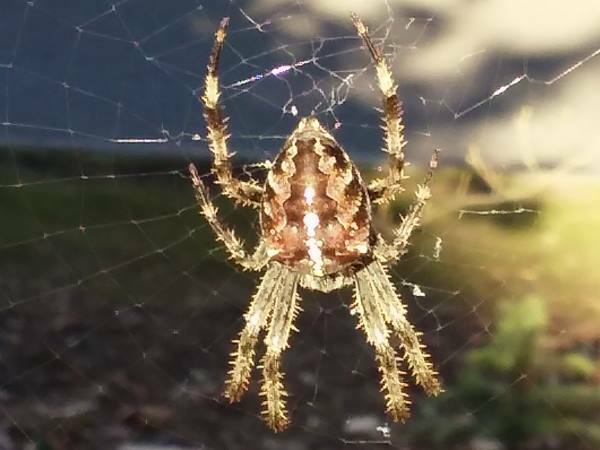 The picture shows a Cross Orb weaver. They are a European import that slowly made the trek across the United States. Look for them primarily in the Twin Cities residential areas. Otherewise, Minnesota hosts a nice collection of additional Araneus species, some of which have common names and are very colorful. 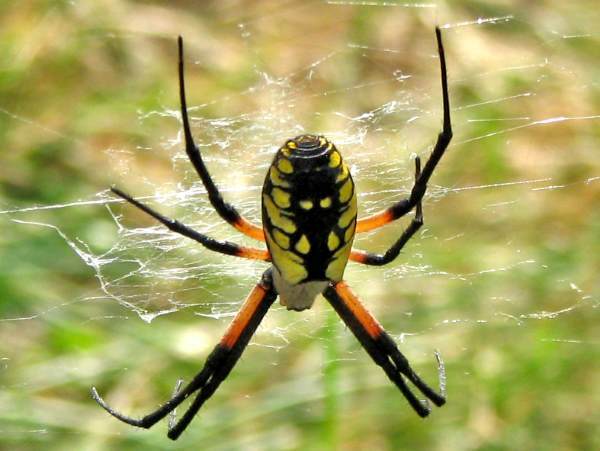 Two argiope species, the Black and Yellow Garden spider, and the Banded Garden spider, are also commmon in residential areas of the state. Argiope spiders get the common name writing spiders because of the presence of a line of what look like “Z” markings down the web. Juvenile writing spiders learning how to weave a web tend to really go to town with “Z” marking prevalent in many parts of the web. Over 315 species of Jumping Spiders are documented in the United States. Minnesota’s Jumping spiders represent about 25% of the total. They can be found in back yards, fields and forests. Therefore, there’s a good chance that a careful examination of yard bushes will bring out of handful of species in every yard. 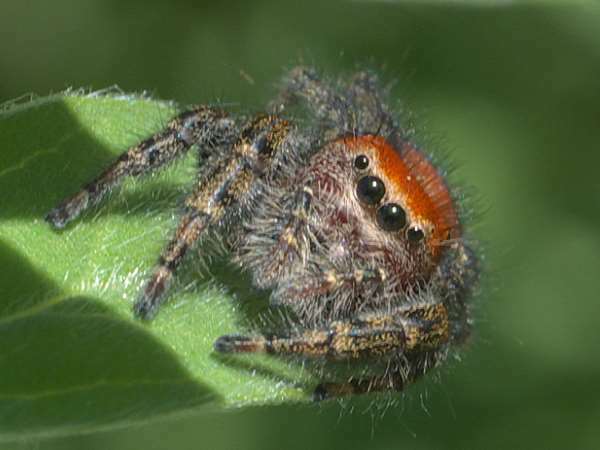 For visitors interested in jumping spider identification further than the family, the list shows 14 Phidippus species common in residential areas and parks. They are usually among the largest of the jumping spiders, and some such as apacheanus and clarus, have red bodies. They share a common feature highlighted in the picture, four eyes across the forehead. Zebra Jumpers, for example, can be found on the sides of many residential buildings. Two different field identification clues help to identify wolf spiders. The picture shows a typical wolf spider with brown or muted color body. This acts as camouflage for the mostly terestrial spider as it hunts prey. The wolf spider eye pattern is always the four eyes across at the bottom with two addition rows of two eyes atop. Female wolf spiders also carry their egg sac on the back of the abdomen. Wolf spiders are common in yards and occasionally make it indoors. They might bight, but they are more apt to flee when spotted. The largest wolf spiders belong to the Hogna species. They can grow to a one inch body supplements by inch long legs. No wolf spiders are considered spiders of medical importance or poisonous spiders.